Easy day and some Dolphins: Elementary Backstroke is just so, so relaxing. Sometimes my mind just drifts as I see the various wisps of clouds above and the occassional plane passing by. Since I remembered it's been a loooong time that I haven't done dolphin kicks, well I tried them again today. Surprisingly, I don't feel any awkwardness at all. And during the whole workout, there wasn't any soreness at the back. I guess I need to push the turns. Mental Toughness! Focus on completing laps without resting. Just do the damned turns! Finally here's a picture of the swim trunks I now have. I had to bring and wear my old crappy cotton/ polyester trunks yesterday at the pool just so I could have this picture taken! That old cotton trunks of mine doesn't wear well when wet. The cotton material just cling too much to your skin when you get out from the pool and it can get embarrasing. 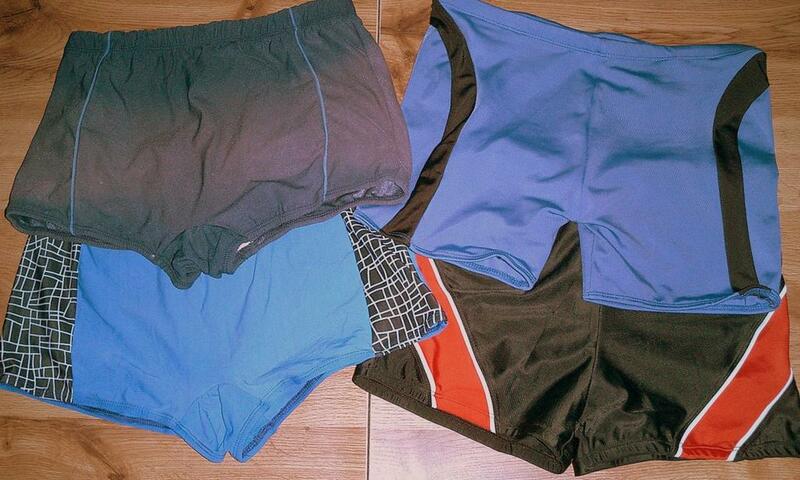 Anyway, the two shorts at the left are what I use regularly. The top one is very old and faded but tough, ToUgH, TOUGH! I think it's made of some nylon material probably invented by some deceased Nobel-prize winning scientist. I just might use it for 10 more years coz I don't see them being sold anywhere anymore. I alternate it with the one at the bottom left. They're both SnS brand. The 2 ones at the right (Nautilus brand) I got on sale from Market Market. They don't look as stretched out as the ones on the left coz they're new.